Four Amazonian tribes have joined forces to oppose the construction of hydroelectric dams in their territory as the Brazilian government ramps up efforts to exploit the power of rivers in the world’s biggest forest. 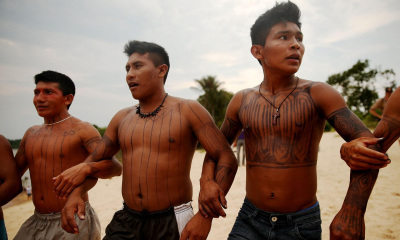 The Munduruku, Apiaká, Kayabi and Rikbaktsa released a joint statement on Thursday demanding the halt of construction on a cascade of four dams on the Teles Pires – a tributary of the Tapajós. They say the work at the main area of concern – the São Manoel dam – threatens water quality and fish stocks. The site has already reportedly expanded almost to the edge of a nearby village, although the local communities say they have not been consulted as they obliged to be under national laws and international standards.